If you want a cute Christmas candy recipe that the kids will love, I've got just the thing! 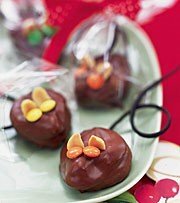 This recipe for chocolate church mice is absolutely adorable and is sure to bring plenty of grins to everyone's face. I found this interesting Christmas recipe and photo at Family Fun. I love their ideas! Just like the name sounds, they've always got great ideas for families. In fact, I've been purchasing the Family Fun magazine for my sister and my niece for the past couple of years from Magazines.com. It makes the perfect Christmas gift. They both are mothers of young children and enjoy all the clever ideas in each issue. It's an inexpensive gift that they can use and appreciate all year round. These adorable little chocolate treats are made up of some of your children's most favorite sweets. These chocolate mice have peanuts for ears, M&M's for eyes and licorice for tails. The stubby little mouse body is made from nutritious dried apricots covered with mouthwatering chocolate! How yummy is that? Melt the chocolate chips in a double boiler with the shortening over low heat, stirring until smooth. If you'd like a shortcut, you can just place them in a microwave safe dish and microwave for 30 seconds at a time, stirring each time until melted and smooth (don't overheat). Press two dried apricots together to form the body of each mouse. Shape one end to be pointy for the nose and run a skewer through them to hold them in place for dipping. Dip each 'mouse' in melted chocolate and place on a waxed paper lined tray to set. Gently pull out the skewer (use another skewer to help you) and dab the chocolate over the hole to hide it. Before the chocolate sets, add 2 mini M&M's for the eyes, poke a piece of the black licorice in the back for the tail. Cut the peanut halves into quarters and use the pieces to form little mouse ears. Place the tray of chocolate mice in the refrigerator to harden more quickly if needed. This recipe will make 24 chocolate church mice. Now isn't that an adorable Christmas candy recipe? I think the kids would really enjoy making this with you. You don't really have to worry as long as you monitor the chocolate melting process. I'd love to see your chocolate candy mice creations, or even a photo of the kids having fun making them. Use the form below to show them off to us.